This GPS Antenna has an SMA connector and a magnetic base. When working with GPS Global Positioning Satellite systems, it is important to have a good antenna. This antenna is designed for use with a GPS system and features a magnetic base for simplified mounting. 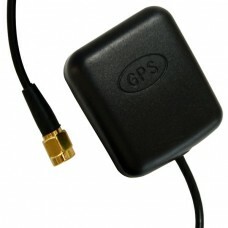 A standard SMA connector attaches to a variety of GPS tracking modules. It operates from 3-5 volts with a frequency of 1575.42Mhz and provides a gain of 20 DBI. The cable is ten feet long.